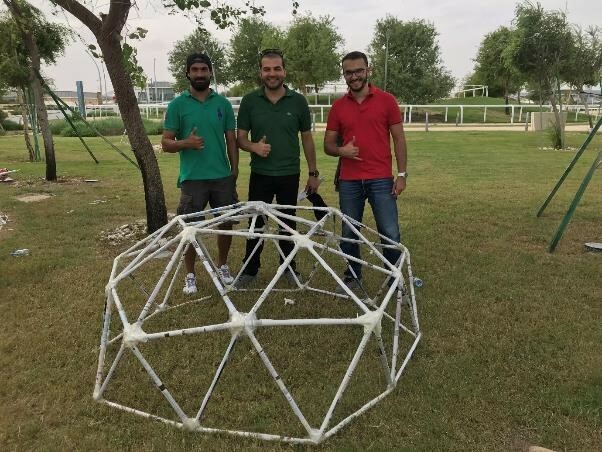 As part of 2018 Qatar Sustainability Week, Engineers Australia Qatar Chapter, Qatar Green Building Council (QGBC) and Qatar University (QU) joined forces to organize the first ever Dome Building Competition. 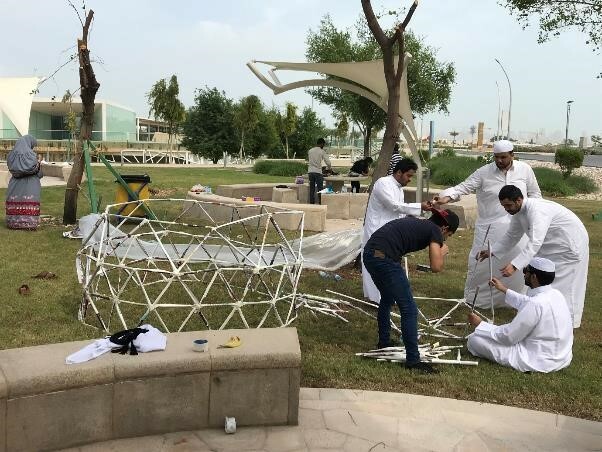 As part of 2018 Qatar Sustainability Week, Engineers Australia Qatar Chapter, Qatar Green Building Council (QGBC) and Qatar University (QU) joined forces to organize the first ever Dome Building Competition in the country. Qatar Sustainability Week is an initiative created by QGBC that aims to further engage the community in a wide range of sustainability-oriented activities. This initiative plays a crucial role in raising awareness among the wider community. Qatar Sustainability Week attracted more than 10,000 members of the public, attending over 100 events held across Qatar. This event was open to all community members including professionals and students. It required teams to be creative and to construct a paper Dome with recycled newspapers, acknowledging sustainability week. The dome required an 800mm minimum diameter and capability to carry a load. Domes were assessed based on technical, functional and aesthetic categories for the awards. The competition took place at Oxygen Park Picnic Area, Qatar Foundation on Saturday, 3rd of November 2018. Weather conditions were windy, but participants considered this as part of the challenge, as all engineers are required to in real situations. Ten teams participated in the event representing different reputable engineering and academic organizations. More than 60 professional engineers, architects, teachers, engineering students, and doctors attended this event with their family members. 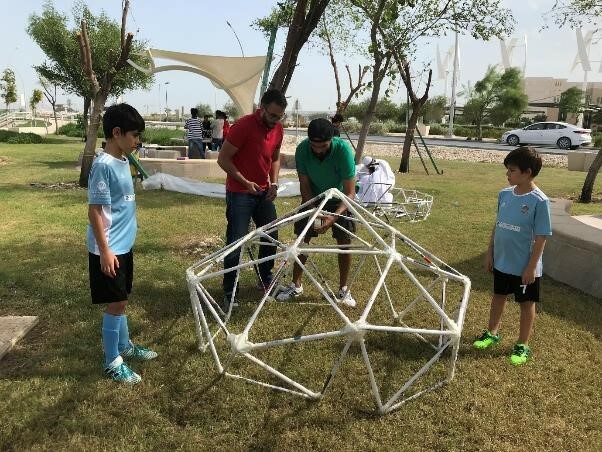 Teams from Qatar University, American School of Doha, AECOM, Cundall and HBK Contracting competed to construct the biggest dome. The competition commenced with an introduction from Mr. Mustafa El Cherkawi (Vice President of Engineers Australia, Qatar Chapter), the organizer of the event, who welcomed the participants and spoke about the objectives of the event, sustainability and the continuous collaboration of EA, QU, and QGBC. He then presented the guidelines, rules and judging criteria. The teams were then given three hours to build their Domes. The competition was monitored by Engineers Australia Qatar committee members. QGBC media team also covered the competition which was posted on their social media pages. Dr. Mohammed Farouk, Civil and Architectural Engineering (CAE) department head at Qatar University attended the event with a number of his colleagues and was part of the judging panel along with Mr. Mustafa Adra, President of Engineers Australia Qatar Chapter. Dr. Mohammed gave feedback to all teams adding to the learning experience from this sustainable, knowledgeable and fun event. A special mention is deserved for the young students from the American School of Doha who worked hard and showed exciting potential in engineering careers, competing with other professional engineers. The first prize for the biggest dome with limited material (Environmental Engineers Perspective) was awarded to Cundall – "Tesla Team" who built a 2V dome with the maximum diameter of 2.2m and height of 1.6m. 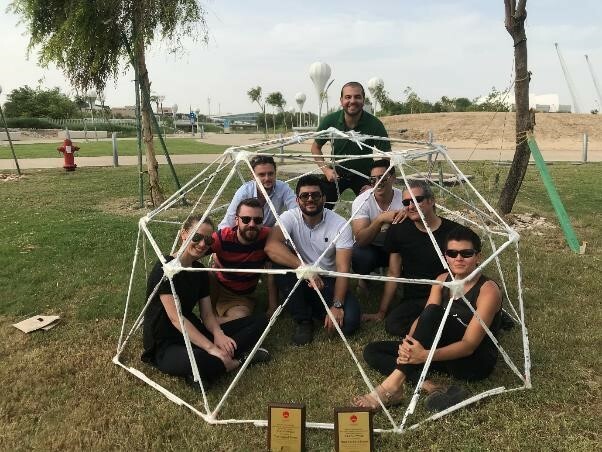 The second prize for the most capable dome of supporting the heaviest load regardless its size (Structural Engineers Perspective) was awarded to AECOM – "A-Team" who built a 2V dome that carried more than 13 kg without failing. They used 4 layers of newspapers to roll their dome struts or members. The third prize for the Dome judged to be the most aesthetically appealing (Architects Perspective) was awarded to Cundall – "Jassim Team" who were innovative and creative presenting a unique 3V design. They used the newspapers for cladding the dome. "Our success of such an event begins with a firm commitment from our committee members coupled with the local community who value innovation within the engineering profession. It is also important to recognize the role of our partners, QU and QGBC for promoting this event during the 2018 sustainability awareness week in Qatar."